Blurb: When B-grade L.A. movie producer Tony Aliso is found stuffed into the trunk of his Rolls-Royce, all signs point to “trunk music” – a mob hit. Detective Harry Bosch, just back from an “involuntary stress lave,” is not so sure. And when he finds the money trail, he follows it … all the way to Vegas. Turns out that just before his death, Tony was seen at a Vegas poker table with one Eleanor Wish – ex-FBI agent, ex-convict … and ex-love of Harry’s life. Now it’s time for Harry to keep his cards close to the table – and his enemies even closer before it’s time to face the TRUNK MUSIC. Review: Oh, Harry … how I love you so much! Seriously, I really like Harry Bosch! I’m slowly making my way through this series, but the books are getting better and better. This one was a really good installment. I found it so much fun to work the case with Harry. I only had part of the “who-dun-it” figured out before it was finally put together by Harry. There’s not much else that can be said about an older book that has already been read and reviewed a gazillion times. 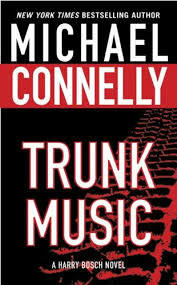 I liked it and I’m looking forward to the next Harry Bosch book!! I’ve only read The Poet by Connelly but have a bunch of Harry books waiting on my shelves for me!